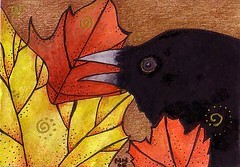 here is a little bit of autumn for you, something i painted a few years ago. 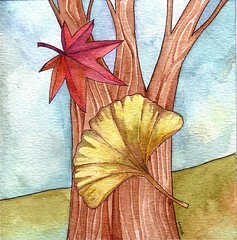 i would probably paint autumnal pictures all year long but i try to wait until it is seasonal. this looks like stathmore paper and maybe winsor and newton watercolors. I usually use Daniel Smith watercolors now and I recently switched to Arches Cold press watercolor paper. But I will sometimes just grab whatever comes to hand - I am afraid I have a bit of a paper hoard. Between the season of falling leaves and sad news in the world I am feeling melancholy. the internet suggest this state is caused by having too much "black bile" - do they mean coffee? well anyway, i hope for a quiet weekend. 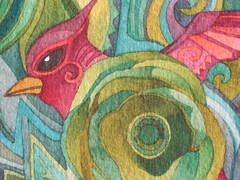 here is another little red bird. i am feeling blue, myself. sometimes it seems like there is just so much suffering and so many sad things in the world. lots of people i see lately. so i am thinking good thoughts for y'all, which is sometimes all one can really do. 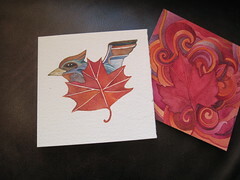 and painting my little birds, which i guess to me represent some sort of faith or hope. this is my latest little painting. 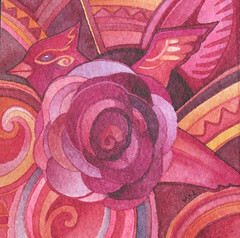 well, not SO little, it's 8 x 8" and i am so happy with how it came out. 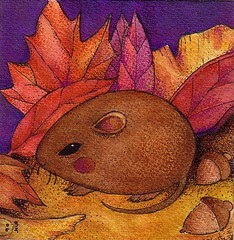 such a cunning little fellow, all surrounded by leaves and autumn colors. I will let you know about more favorites in days to come! 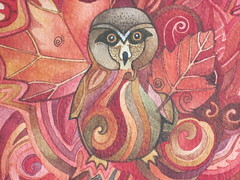 the little owl is available in my Etsy Shop. I have so many art ideas now and not enough time! though I guess that is better than the opposite. 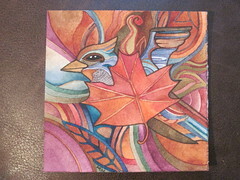 Here is how I finished up the little bird I posted when it was in progress. Most of my pieces seem to have a mind of their own - to a certain degree. and I guess it's my job to get out of the way and maybe not over think things. My friend Kathy said she thinks that is why I like to listen to audio books while I paint - to shut my little whirring brain off, or at least slow it down. distract it. I like the idea of being a vessel for art. 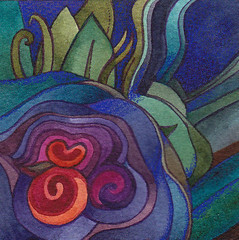 I started an 8 x 8" painting last night that I thought was going to be blue, purple, and brown, but it immediately insisted on being green and brown, and when you're going with watercolor instead of oil or acrylic you can't just do EVERYTHING over, so i needed to sort of coax the purple into getting alone with the green. i think it's going to be an art weekend, we'll see what I get done. 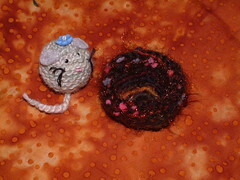 this little creature is on etsy. this little bird is my new favorite thing ever! but it's not done yet. I am fighting a nasty cold so I may not get any art time today. I just wanted to share an in-progress picture! i think this is the start of a new series. i can't sleep so you get another blog post. not that i have much to say! 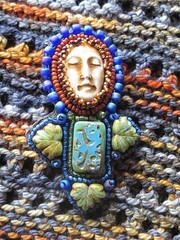 i am still working with blues and brilliant warm colors but yesterday i threw some vibrant spring greens into the mix. and then last night - you don't get to see this yet - i was working in brown and grey and blue and am still excited about the results. 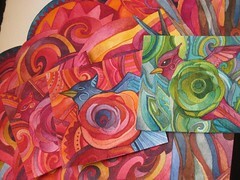 well, i've been using a lot of warm colors lately, magenta, fuchsia, scarlet, orange, and warm purples. but i've also been using blues, greens, and cool purples. i love how this cobalt pops against magenta! i finished this painting! it took me a week - and i was painting most of the time i was awake and not at work. i am happy with this, but the things i am working on now are not as bright. i've switched over to a cooler color scheme - blues, greens, and browns mostly. well, so far. it is quite possible some more colors will creep in there when i am not looking! 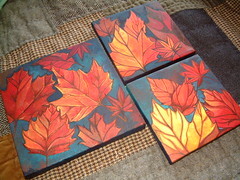 I listed these 2 autumn paintings, acrylic paint on gallery canvas, on Etsy. every day of afternoon sunshine I just want to enjoy it as much as possible, and every afternoon of rain i am afraid it will rain for 6-months straight. (this is Seattle. that could happen.) but i think there are a few more days of sunshine, at least. if i ever move it will absolutely be to a place that gets more sunny days a year than Seattle. though Seattle is quite nice in summer - not too hot. here we have a little mouse, and her nest. i was thinking of making a little hut for her to put her nest in. keeps off the rain. i might work on that tonight. it will probably be made of felt. or i might start a new painting. 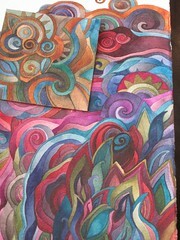 i am thinking of doing a 10w x 20h painting of a tree in blues, browns, and greens. i might add some purple too but that is a little up in the air now. what color do you think trees should be? and what other animals need little huts? bonus points if their bodies are more or less shaped like fat little walnuts because those are easy to crochet. lick on this image to go to flickr and see things bigger. or smaller! or from different angles. well, some angels anyway. i worked yesterday so today feels like tuesday, which it is clearly not! but at least there is a little late autumn sunlight, i went to the park at lunch and lay in the sun and read. oh, how i miss the park in winter. i still go for short visits but it isn't the same! i have been painting a lot. 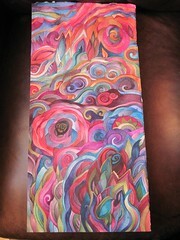 the larger painting here will be 10 x 20" when it is done. i wish i could paint all day long! 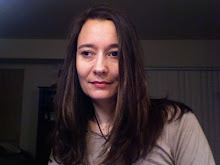 i have been reading a couple series by Cherie Priest, and I just love her books. I read two of her Eden Moore Books and have the 3rd reserved at the library. I started Bone Shaker last night and I love it too. For anyone interested in steam punk, Seattle, Seattle history, and / or underground Seattle i recommend!! Here is my nod to blue. Or one of them anyway, I love this pure cobalt blue. I suspect I will be using it more in days to come. 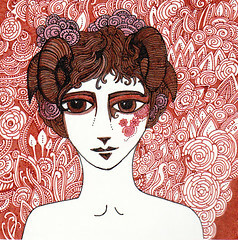 this particular drawing is watercolor, ink, and colored pencil on watercolor paper. It's available on Etsy. It has been a kind of rough week. I am working Sunday, but am glad to have Saturday off. I can't decide if I am going to do some art or just do some nothing! see nothing but sand; the angels come to visit us, and we only know them when they are gone." 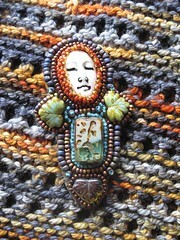 i listed 2 new angels on Etsy. This angel is something I was working on last week. I have not been feeling very well but have still done some art as I am able mostly little projects i can do curled up in bed, leaning against my headboard. i've also been listening to audio books, most recently Salman Rushdie's Midnight's Children, which is wonderful. A wonderful book and the reader really adds a lot to my appreciation and understanding. It's both an excellent magical realism novel and an exposure to the history of India and Pakistan.Definitely a different perspective than my earliest exposure to the history of that time period - through the film Ghandi which I think I saw twice in the 6th or 7th grade. 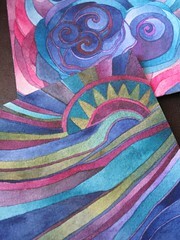 I have some new watercolors too that I need to scan - I'll see how much energy I have when I go home tonight! This is a little drawing I finished a couple of days ago, and it seems appropriate for today. Demeter was the greek goddess of the harvest and fertility.
" I begin to sing of Demeter, the holy goddess with the beautiful hair." -- that is one thing Homor said about her, and quite a bit more, if you would care to learn more about her. When I was little, one of the first books I ever bought with my own money was D'Aulaires Book of Greek Myths, which I still have today. I always loved the photos. Anyway this is my idea of Demeter, probably as a younger goddess, she does not look old enough here to be the mother of Persephone. She is on Etsy.